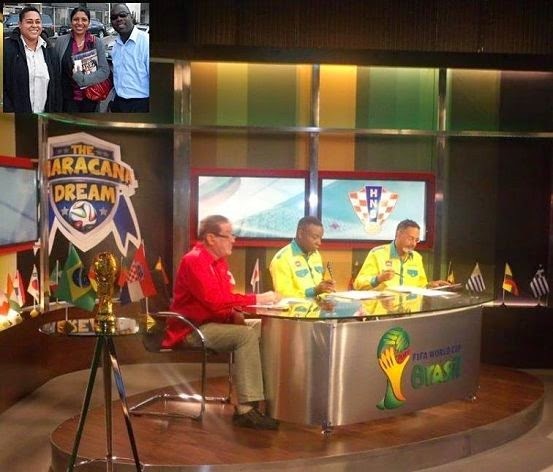 DREAM TEAM: CVM's World Cup analysts on the job in studio. Inset, Ricketts (right), with Trini colleagues at a Los Angeles screening, 2011. On a golden Thursday morning, Ransford Ricketts has football on the mind as he leads the way to a speakeasy interview room at CVM's Constant Spring Road Studios. A busy man with a full plate, Ricketts, the station's forward-thinking Programmes Manager, wastes no time in getting down to business, outlining the vision that's been driving the station's exclusive local coverage of the Greatest Show on Earth aka the World Cup of Soccer. With Jamaica in the happy grip of football fever (World Cup mania has virtually captured the public imagination), CVM has found itself at the centre of all the excitement, rising to the occasion, intent on meeting and surpassing viewer expectations. "As far as covering the World Cup goes, it's a challenging thing but it's also an enjoyable thing, and you feel the satisfaction when you deliver. And CVM has delivered," says Ricketts, a squarely built 34-year-old with an easy-going vibe and large, limpid eyes that pull you in. His deep, sonorous voice immediately suggests a man who strives for the best. "All in all we are satisfied with the coverage so far. We still look for ways and means to improve what we are doing on a daily basis to meet the demands of the viewers. And to me this is by far one of the best coverages any TV station in the Caribbean has ever produced." He should know. A practicing media professional since the 90s, Ricketts comes by his convictions the old-fashioned way: by putting in the work and keeping abreast of the latest advances. Before CVM, the publicity-shy Ricketts studied for degrees at Manchester's Northern Caribbean University (a major in Mass Communications) and the Kingston-based University College of the Caribbean (a Commonwealth MBA) before getting his feet wet at the Public Broadcasting Corporation of Jamaica (PBCJ), later stepping up as Operations Manager at the Jamaica News Network (JNN). He's written for the Mandeville Weekly and completed a career-defining stint in the Cayman Islands, where he was instrumental in the genesis of a brand-new radio station. "So I've been through the whole gamut of media," he concedes, laughing. Reflecting on then and now, what does he make of the state of broadcasting in Jamaica today? "It is definitely expanding, particularly with the explosion of social media over the past five years. I mean you can't have traditional media without adding some mix of new media to it because the world is growing," Ricketts insists, noting that CVM's Football GPS reached new heights of popularity thanks to online viewing, Facebook and Twitter. "It's a very competitive landscape, but without new media, traditional media would be stagnant." More often than not, it takes a total team effort to make a business thrive, and CVM is no exception. But one gets the feeling that Ricketts is a hands-on leader bursting with smart, fresh ideas and who knows how to stir the pot to gauge viewer interest and preferences. "TV is a dynamic entity; it evolves every day," he tells me. "Today people may want to see a reality show and tomorrow the appetite may change to something else. So it is how you position yourself to forecast where the dynamism is, where the shift is going and be able to meet those demands. But it's not always going to be easy." A huge fan of Ben Carson's Think Big, Ricketts is used to the hard work and clearly relishes new challenges. Doubling efforts for CVM to finally reach viewers in every single nook and cranny in Jamaica represents a gargantuan task, but he's far from backing down. 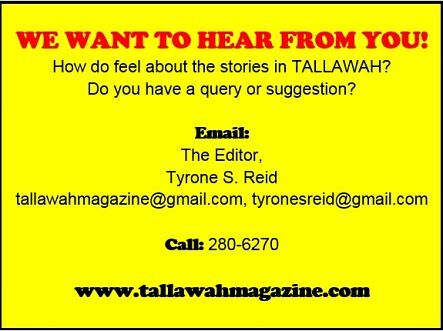 "We've said it over and over that with free-to-air and cable we've already covered 95 percent of the island," he reports. "It's a mandate of the board that we get to 100 percent coverage of the island as quickly and as best as possible." There's a TV screen in practically every room and office at the CVM Studios blaring crisp action of the Maracana Dream unfolding in Brazil. Ricketts beams as he walks the corridors, inhaling the heady aroma of the beautiful game, the rich feeling of a labour of love bearing succulent fruit. But he knows he's a good way off from the finish line. "I must say that we have learned, we have grown, we have corrected some of our mistakes from the past, and we have delivered," he says. "And I must say thanks to the sponsors who have come on board. It is because of them that we've been able to bring this world-class coverage to the people of Jamaica."